In a stunning new photo, NASA’s Dawn spacecraft has revealed mysterious bright spots on the dwarf planet of Ceres, found in the asteroid belt between Mars and Jupiter. 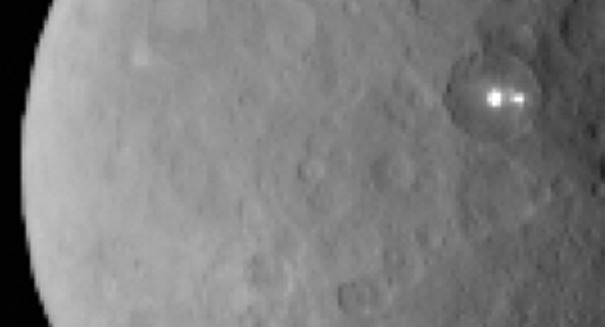 The relatively high-resolution image (450 feet per pixel) is the closest view man has yet captured of the deep Occator crater. The most startling element of the a crater filled with unusual features is the collection of bright white spots located on the center of the crater’s floor. The explanations of what the spots are run the gambit between ice reflecting the sun’s light to salt flats to an alien civilization. Even with the new photos, scientists still can not say for sure. “Dawn has transformed what were so recently a few bright dots into a complex and beautiful, gleaming landscape,” said Marc Rayman, Dawn’s chief engineer and mission director from NASA’s Jet Propulsion Laboratory in California. NASA has also released a virtual animation that colorfully depicts the topography of the crater. It reveals that Occator is almost completely vertical in some places. “Soon, the scientific analysis will reveal the geological and chemical nature of this mysterious and mesmerizing extraterrestrial scenery,” said Rayman. Launched in 2007, Dawn is the first mission to ever visit Ceres. It will map the entirety of the dwarf planet over the course of the next two months. Ceres is named for the Roman god of agricultural. According to the ancient myths, Occator was her assistant.